Whitchurch Amateur Operatic and Dramatic Society are an amateur group who produce mainly Musical stage shows ranging from the classics such as ‘Iolanthe’, ‘The Mikado, 'Me and My Girl’, ‘Fiddler on the Roof’, ‘Anything Goes’ to 'Godspell’ to name a few, as well as our recent production of ‘Little Shop of Horrors'. In addition to these we also perform Pantomimes, our next being ‘Snow White and the Seven Dwarfs' in December of this year. Early in 1924 Mr Leonard Lee, a local business man, had the idea of forming an Operatic Society for the people of Whitchurch and the surrounding area. He called a few friends to a meeting and subsequently Whitchurch AODS was formed. 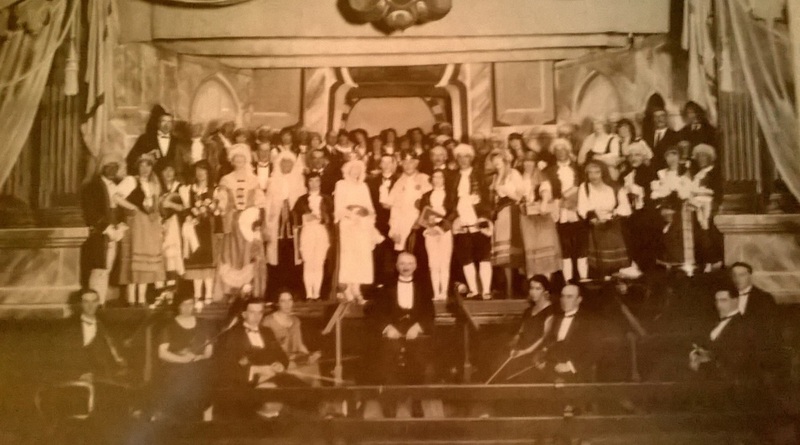 In March of that year applications were invited for membership and in late 1924 Gilbert and Sullivan’s ‘The Gondoliers’ was performed in the then Town Hall. In 2014 members were delighted to be celebrating the 90th birthday of the society with a Summer Ball held at a local hotel last July. The Society is mainly an adult society but does welcome children when the production calls for it. New members are always welcome whether it be to be on stage or to take part in the all important off stage duties. We rehearse usually on Tuesday for Principals and Thursday for Chorus with some Sunday Rehearsals when opening night is fast approaching. Our shows are performed mainly in the Civic Centre on the High street but we also use the Talbot Theatre at Sir John Talbots Academy on the outskirts of town. The Society is itself a Charity but members always try to work and help other Charities both local and National. We are also affiliated to the National Operatic and Dramatic Association and have been delighted to receive awards and nominations for our shows. Whitchurch Amateur Operatic and Dramatic Society is proud to be affiliated to the National Operatic and Dramatic Association (NODA) which was formed in 1899 to protect and advance the interests of Operatic and Dramatic art, and of societies engaged therein. It provides professional support for amateur theatre to enable societies and individual members to achieve the highest standard of performance. Noda’s vision is that amateur theatre is successful and sustainable, providing a range of opportunities for people to develop their skills and enjoy taking part, at all levels. They are there to support the education and information needs of individuals and organisations with high quality services and products that contribute to the success of amateur theatre, as well as encouraging appreciation of the sector by participants and audiences alike..